Synopsis: From a chance encounter in a dentist’s office to a renewed acquaintance in a museum, the Bull Chair attracted Ludwig Ostfeld for years before he set out to build his own version. His reward was a project well done and a chair built for style and most importantly, comfort. Why do we build the things we do? When I look back, having completed a piece, I can see that for me, the inspirations that lead to a specific project are often planted over the years and slowly germinate until they come together to produce a piece of work. That’s how it was with my replica of the Bull Chair. When I was growing up, my parents loved to take me to museums, and a big favorite was The Yale Art Gallery in New Haven, Conn. I’ve been a regular visitor there ever since. A number of years ago, the gallery had an exhibit called “Have a Seat,” featuring American chairs made in the 17th, 18th, and 19th centuries. The exhibit had everything from Queen Anne, Chippendale, and Windsor chairs to plainer versions. Many of the chairs were highly ornamented, with ball-and-claw feet, cabriole legs, and carvings, but a major emphasis of the show was that the chairs were designed to be comfortable. There even was a place to sit in the chairs and evaluate which were the most comfortable. That memory has stayed with me. Woodworking is not my only creative outlet. I’ve studied glass for years, and I made my living as a union carpenter. Over the years I acquired skills in furniture making by reading books and articles and learning from Harold Hayes, a fine craftsman who made his living replicating early American furniture. 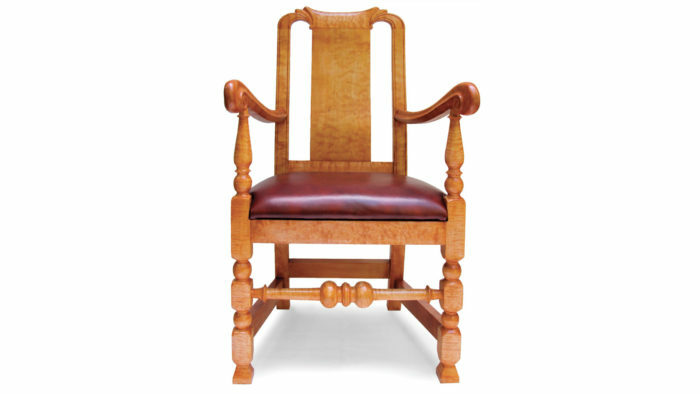 Harold used to say, “Making chairs separates the serious woodworkers,” because there are so many daunting skills associated with the process. When I began to build furniture I was not only taken with early American, but also Scandinavian and Japanese designs. I closely followed the writings of James Krenov, George Nakashima, and Soetsu Yanagi, author of The Unknown Craftsman. Mr. Krenov instilled in me the importance of using special boards in a clean design. I made tables, chests, and chairs—some of them reproductions of early American furniture—and from that I learned more about the importance of proportion and good design. A few years ago, I paid a visit to an antiques store in Colchester, Conn., where the owner showed me miniature reproductions of one-of-a-kind chairs that had been carved by a dentist. One of these was the Bull Chair, and it fascinated me. It seemed familiar, and I wanted to learn more about it, but there was little information. Then, on a return visit to Yale in 2016, I came upon the full-size Bull Chair itself. Immediately, I knew that I had to try to make a replica. 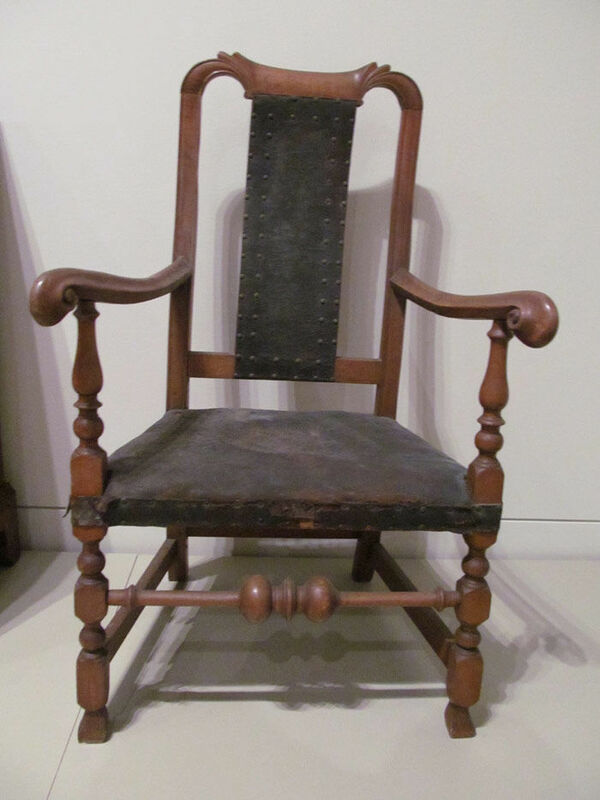 Still, there was limited information: The chair was described as maple, made around 1750. Sources speculated that it was crafted somewhere near the Connecticut-Rhode Island border. After taking a discreet series of photos over a few weeks I gleaned a couple of dimensions from the front and side. A friend helped me figure out the templates and proportions from these few dimensions. In my view, this chair deserved to be made of beautifully figured wood, so I chose quilted maple. In 1750 big-leaf maple (acer macrophyllum), was not available in New England, but I had some special boards laid away and thought this was the time to use them. This choice of wood was an obvious statement that my version was a modern replica and not a true period reproduction. I did encounter some difficulties as I built the chair, due to the curvilinear qualities of the splat and arms. The original chair used leather and heavy nails on the splat and seat, which I didn’t want. Instead I focused on using the figured wood to best show the beauty of the arms and proportions of the chair. I also modified the front feet to make them more durable and I added some padding to make the seat more comfortable. I have had the pleasure of sitting in. Ludwig Ostfeld (ludwigostfeld.com) is a woodworker and glass artist in East Lyme, Conn.